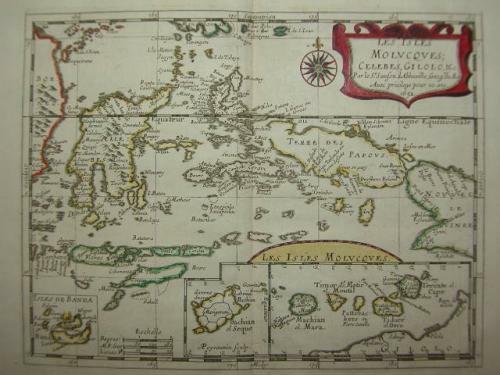 Title: 'Les Isles Molucques; Celebes, Gilolo &c...' Paris, 1652. From '"L Asie, en plusieurs cartes nouvelles,..."
Fine, original, copper-engraved map of the Spice Islands - East Indies - Celebes, Moluccas, New Guinea, with original outline hand-color, by Nicolas Sanson D'Abbeville. A beautiful, detailed map with an elegant title cartouche. These quarto maps by Sanson were distributed first in regional atlases (Asia in 1652, Africa in 1656, Europe in 1648, and America in 1658.) . A fine dark impression, bright original color, heavy paper, large margins, light browning near edges, otherwise fine.